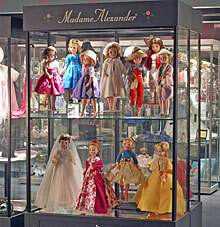 We still have spaces for the Madame Alexander Doll Company event at a cost of $125. If you can't make it, be sure to register absentee. You won't want to miss our exclusive fabulous outfit that MA produced to fit Gene, a gift to attendees and absentees for this event! Mel has designed an exclusive Cissy Centerpiece, a limited edition of only 30 for this event. She will be sold for $425 by lottery at the event, and then sold to attendees on a first-come basis from our RSVP list. Tim Alberts and Doug James, original Gene Team designers and Madame Alexander designers, have agreed to join us for this event. See the agenda for bus information. After the MA event, two buses will return to the convention hotel, but we will have one bus (#3) that will take people to Times Square and the Theatre District if there is enough interest. Tickets for many shows can be purchased at the TKTS booth in Times Square, often at half price, or you can try your luck in a cancellation line, or at the box offices. You can even purchase tickets for this evening on your own, now. There are lots of restaurants, shopping, and sightseeing opportunities in that area, and all the lights are a must see! We have left Thursday morning and afternoon open for sightseeing on your own. There is SO much to see and do in NYC! The hotel offers a complimentary shuttle to the train station. The express train goes directly into Grand Central Station with no stops. 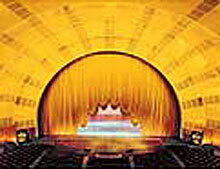 Be sure to check Lt Col Elaine's guide for fabric stores and other things to do in NYC. 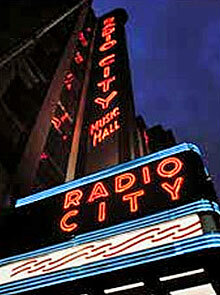 Complete visitor information is available at the NYC official tourism website. We are now SOLD OUT of tickets for the Radio City Music Hall Christmas Spectacular starring the Rockettes and have a waiting list. Sandra sent a confirmation email to everyone who RSVP'd or paid for tickets. If you or anyone you know have paid for or reserved tickets and DID NOT get a confirmation email from Sandra, please contact her ASAP. There is a big holiday doll show on Sunday at Rothman Center in NJ. We have had several requests for buses from the hotel to the show. The buses would leave the hotel at about 9 a.m. The show is over at 4 p.m., but it is possible we could arrange an earlier return if there is enough interest. The cost for transportation would be about $20-$25 each if we fill a large bus. Please e-mail Sandra you are interested. This will not interfere with our salesroom. 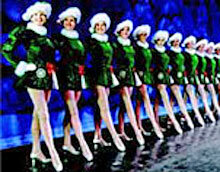 Those who are going to the Rockettes can still go to the Rothman Doll Show and then the buses will take you to Radio City Music Hall at about 1 p.m. This would give you about 3 hours to shop at the doll show. Again, please e-mail Sandra if you want to attend the Doll Show.